Even in this day and age of computers and technological advancements, many people still find dentures to be reliable replacements of missing teeth. Dentures are durable and long lasting, essentially providing complete smiles to many patients over the years. If you’re using dentures, taking care of them is important for oral hygiene and gum health. Here are 4 simple ways to care for your false teeth from expert Maryville, TN dentist, Dr. Kim C. Norman. Clean your dentures every day. They’re just like real teeth in that plaque and food particles can adhere to them quite easily. Brush your dentures after meals with a soft bristled toothbrush, to prevent stains and plaque from sticking to its surface. Do not, under any circumstances, use a toothpick to remove particles from your dentures. This won’t do any good and will just damage your false teeth. Take advantage of denture cleaners. These products have been invented just for denture users like you. Denture cleaners are specially made for dentures; hence, they won’t damage or stain the dentures during the cleaning process. If you’re unsure of which brand of denture cleaner to choose, ask a recommendation from Dr. Norman or choose a brand with a seal of approval from the American Dental Association (ADA). Treat your dentures like glass. Even if they’re not as breakable as glass, treating them as such will reduce accidental dropping and damaging your dentures. 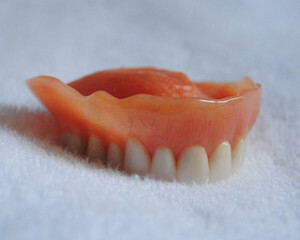 In handling your dentures, place a towel underneath so your dentures won’t experience a hard impact if you drop them. Store your dentures properly. During sleep, when dentures are not worn, it is best to store them in a denture soaking solution or water. Dentures need to be kept moist, so they retain their size and shape. You are advised not to use hot water or soaking solutions not intended for dentures. It is also important to take care of your gums when you’re using dentures. Dr. Norman advises you to never sleep with your false teeth inside your mouth. Using dentures for the first time is the only time that you should sleep with your dentures, and then only for the first 24 to 48 hours. Try to maintain good oral hygiene. You can use a mouthwash to clean your gums every day, as well as a tongue cleaner. Brush softly your gums and palate, to keep them in good condition. Make sure to clean your mouth before wearing your dentures. If missing teeth are a concern, allow Dr. Norman to evaluate your condition and determine the best possible tooth replacement option for you. Dentures are reliable tooth replacements that have served us well for years. Dr. Norman is a trusted dentist in Maryville, TN who can best determine your eligibility for dentures. Visit us today, so you can meet Dr. Norman in person! He looks forward to seeing you soon.